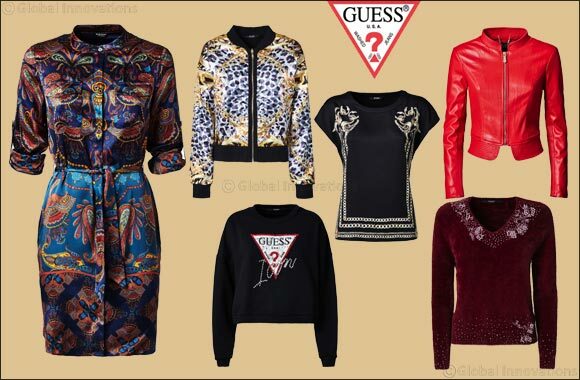 Dubai, UAE, August 08, 2018: The new GUESS Jeans FW18 collection is loaded with urban, street and Nineties influences, revisited in a contemporary key. A fusion of suggestions that celebrate the freedom of creating a personal and unique style. Night queens won’t be able to resist these highly seductive designs. Sophisticated black is contrasted by vibrant colour tones, like fascinating surreal teal or bright bordeaux, for eye-catchingly feminine silhouettes. Meanwhile, everything, from tops, dresses to accessories, gets an added dash of shimmer with gold or silver-plated fabrics, sequins, lamé and iridescent fabrics with futuristic accents. Denim also gets the dazzle factor, thanks to a special shimmer-effect, and a smooth coating that gives an alluring leather look and feel.